Château d’Anglès in the Languedoc has made something of a specialty of its old white bourboulenc grape variety. 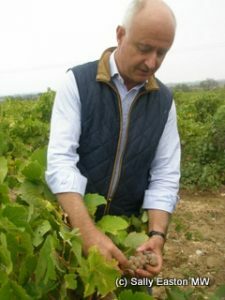 The book “Wine Grapes” identifies its origins in neighbouring Provence, though some two-thirds are now grown around La Clape in the Languedoc. 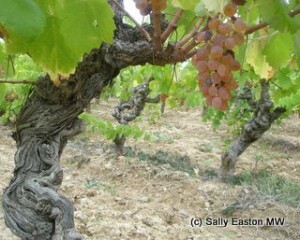 Of their 36 hectares of vineyard, six are bourboulenc, some up to 80 years old. France in its entirety has only around 600ha of it planted, and all of them across southern France. The cultivar is a late ripener that prefers a warm and dry climate, keeping its natural acidity despite the sun’s heat, so the Mediterranean’s La Clape is a good home. Its thick skins require plenty of warmth and sunshine to ripen properly. “You need a lot of sun to ripen bourboulenc” Vianney said prosaically. The grapes were still on the vine, and tasting rich and sweet, at the beginning of October 2012, forecast to be harvested during the second week of that month. Château d’Anglès is unusual in La Clape with white wine accounting for a third of their production. More normally, Eric explained, La Clape producers make less than 10% in white wine. A tank sample, still maturing. Tropical fruit nose, slightly honeyed with a soft, supple palate attack, rounded, smooth and succulent. There’s some salty perception here on the mid palate (probably by association as it’s been discussed during the visit), plus something a bit clove-like. Clearly needs time to settle in still (that’s because it’s a tank sample! ), it’s all a bit edgy, in a good and promising way. It has attractive freshness, softness and suppleness notwithstanding, and fine ‘grainy’ texture. A hot vintage. This will be bottled in a few days. Honeyed nose, tangerine notes, with quite a plush texture and erring to tropical fruit. Less spicy than the 2010, and more overtly fruity. Full-bodied, with some stealth muscle. Attractive wine. Elegant vintage. Spicy nose, hint toasty even. Full fat, almost buttery, which might be bottle age or rich oak. Erring to oily and dry toasty and salty on both the nose and the palate. This is a full fat version, with a broadening palate, and one that still has freshness and balance. Good. Spicy, aromatic, of cloves and nutmeg. Initial palate attack has oily note, leading into well-structured core, rich and plush on the palate. Flavoursome and dense, freshly textured, has an enticing textural prickle on the side palate. Full, long and wholesome Vg. Some rain this vintage. Slightly muted nose, less overtly aromatic, possibly a bit loose. Still has fresh balance, but it is a different sort of balance, as I think about phenols and freshness in whites (see later post). Hot vintage. Dry toasted bottle age a bit like semillon actually, that oily, lanolin toasty note. Still has textural freshness and ‘tang’ on side of tongue. Broadening out a bit now, but long flavours. Fresh, fresher/younger than 2003. with citrus and ginger, even, amid peachy, mango fruits. Maybe crystalline fruits rather than fresh fruits, but in a youthful mould. Lovely fresh balance, texture, complexity and concentration. Good. This wine was not made by the Fabres as it predates their purchase, but they did make the blend. The previous owners used more new barrels. This is the most mature wine, even beginning to oxidise a little. For me, it’s less interesting than the work being done by father and son. My visit to the Languedoc was sponsored by a group of half a dozen producers.